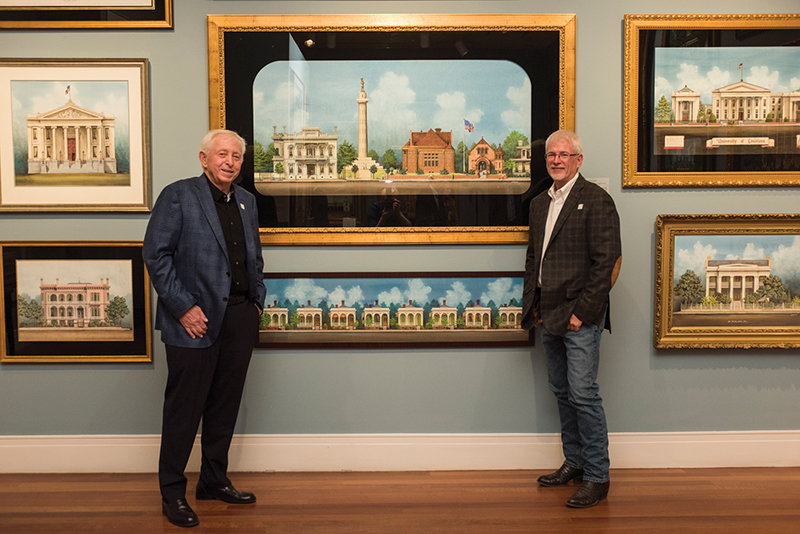 Jim Blanchard (right) poses in front of his work “Howard Memorial Library” with Bill Goldring during the opening reception for “A Precise Vision: The Architectural Archival Watercolors of Jim Blanchard” at the Ogden Museum of Southern Art. Blanchard’s work was featured in the museum’s exhibitions to celebrate New Orleans’ Tricentennial. Todd Murphy, Jim Henderson and Nick Karl attend “Gala Royale,” the Jefferson Chamber’s 21st anniversary celebration in March. The event was held at the Ochsner Sports Performance Center and was presented by Ochsner Health System and hosted by the New Orleans Saints and Pelicans. Montgomery Creamer, Samantha Kurtz, Brandy Christian and Francisco Christian are pictured at Jefferson Chamber’s “Gala Royale.” The event featured an open bar, hors d’oeuvres by Pigeon Caterers, over 75 silent auction items, a parade of prizes, punch wall, dancing and live musical entertainment by the Bag of Donuts. Mickey and Hilary Landry hosted an event at their Nashville Avenue home in March to announce the Communities In Schools of Greater New Orleans’ expansion to the entire Gulf South. Terri Wittenberg Benton accepts the All in for the Kids Award on behalf of her parents, Frankie and John Wittenberg. The award was granted to the Wittenbergs posthumously and presented to their daughter at the Community in Schools of Greater New Orleans expansion party in March. Dr. Qi Charles Zhang, Vineen Huston, Tiffany Delcour and Dielda J. Robertson attended the seventh annual “Brass Bash,” a yearly fundraising party to benefit Luke’s House. This year’s bash was held at The Howlin’ Wolf and featured live music, a silent auction and a photobooth. Lyndsey Kirchner, C.J. Kwan, J. Brent Wallis and Rebecca Tamayo are pictured at the “Brash Bash” in March. Proceeds from the event benefited Luke’s House’ mission to provide free health services to the medically underserved. Allen Square, David Payton and Emily Madero attended the Idea Village’s annual dinner during New Orleans Entrepreneur Week in March at Commander’s Palace. Guests were treated to cocktails in the courtyard before dinner in the Garden Room. Ting-ting Rivers, Jen Medbery, Tim Williamson, Lindsay Fox and Severti Wilson enjoyed a cocktail in the in the Commander’s Palace courtyard before the Idea Village’s annual dinner in March. Shawn Hall is pictured in front of her work “BIOlogy” during the opening reception for “The Whole Drum Will Sound: Women in Southern Abstraction” at the Ogden Museum of Southern Art.